If you’ve been around here awhile, you guys know that Nova is one of my favorite (if not THE favorite) superheroes. I’ve written about him before and posted some artwork back in the day. My last Nova piece was called 3D with Blender, Daz and The Man Called Nova. That one has a lot of artwork, and shows the entire character. This piece only focuses on his helmet, which I think is his defining physical attribute. Just to break it down real quick-like. Nova is Richard Ryder, a Human member of the Xandarian Nova Corps. They’re essentially Marvel’s answer to DC’s Green Lantern Corps. So they’re space policemen out there patrolling the galaxy trying to help people. Nova was a mid-tier level hero, meaning he was tougher than Spider-Man but not as tough as the Hulk. All that changed when an invasion force from the neighboring anti-matter universe wiped out the Xandarians and the entirety of the Nova Corps, leaving only Richard and the Xandarian “Worldmind” – an entity comprised of the sum total of Xandarian intelligence and culture. Desperate to save what was left of Xandarian civilization, the Worldmind infused the entirety of the “Nova Force” into Richard, so now he contained all the power of the entire Corps. From mid-tier to A-List, just like that. 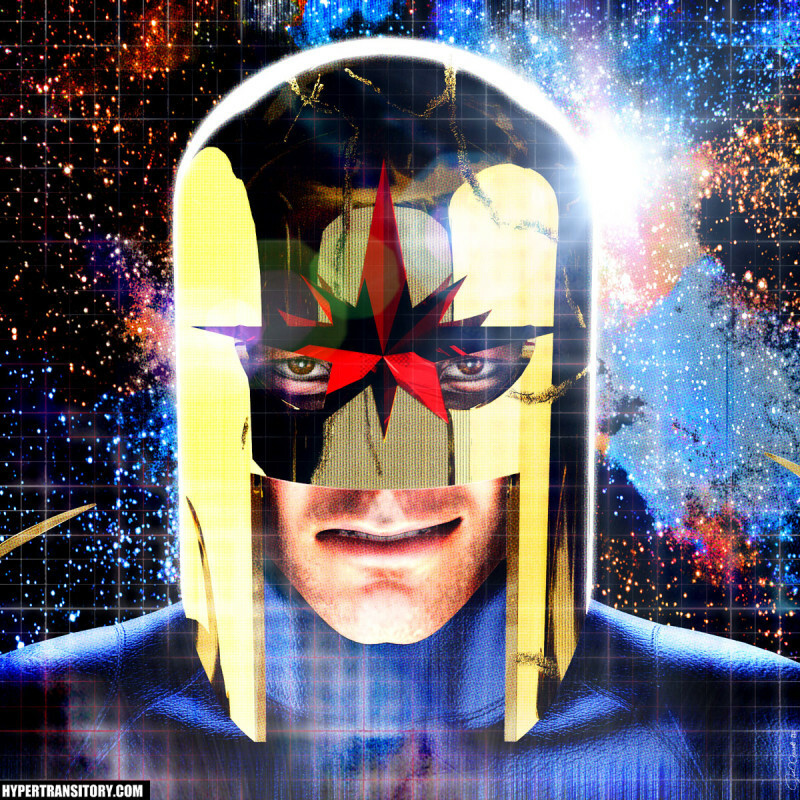 What followed was an excellent series of adventures, as Richard tried to save the universe and restore the Nova Corps. As a sci-fi fan, this was the kind of comic that was tailor-made for me. Except, for whatever reason, Marvel decided to cancel it, effectively kill Richard and replace him with a fairly lackluster teenager named Sam. Obviously Richard will be back, but when that will be I have no idea. For now, this helmet artwork will have to tide us over! As usual, my 3D modeling is done in Blender. It looks like there’s a lot going on in there, but if you check my screenshots of the working file, you’ll se it’s not as complex as you might think. 1. Fake it. If you decided to fake it, you can use an “Environment Map” or texture, which will be a piece of art or a photo that you want to appear reflected in your object as if it’s really modeled in your scene. This spares you from having a lot of “geometry” in your scene, and cuts down on render time by sparing your computer from hiving to actually calculate all those light bounces and such. You may miss out on some of the “magic” of having some realistic reflections, though. 2. Really allow your texture to reflect. If you go this route, your scene has to be set up with precision, otherwise you’ll get some of your scene pieces or stuff you might not expect showing up in your reflections. Or if you don’t have anything particularly interesting in your scene to reflect, your object will look really boring. Possibly the worst part is the hit your computer will take when it’s calculating all the reflections. If you have a beefed-up rig, you’ll be ok, but I tend to be careful with that sort of thing so my render doesn’t take any longer than necessary. 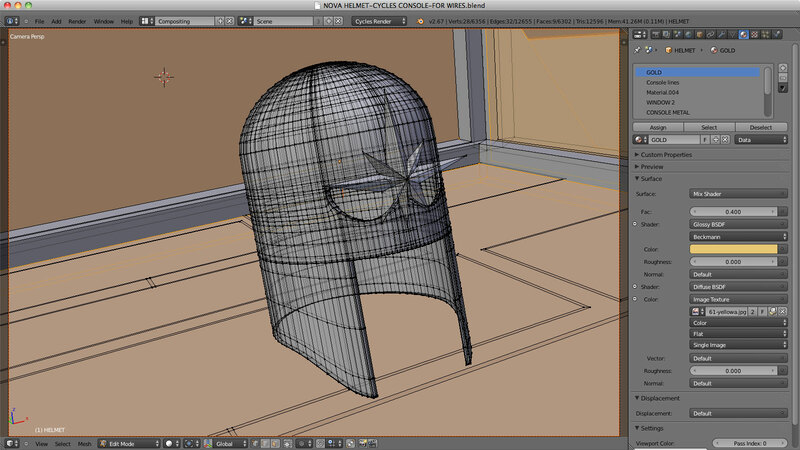 In the case of this Nova Helmet piece, I opted for both methods. 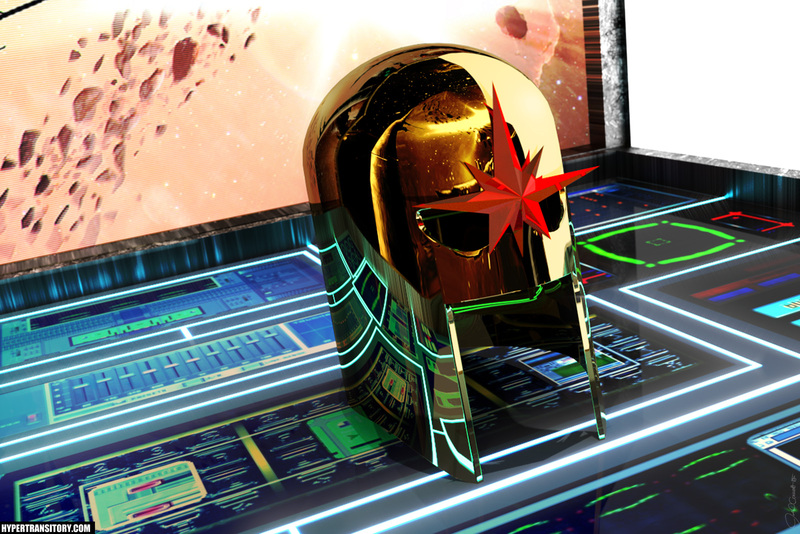 The same piece of art that’s on the monitor behind the helmet is set as the environment map on the helmet, plus I’ve allowed the helmet texture to reflect the computer console controls beneath it. In this case, it worked out how I wanted it, so all was good. Whew! When I made this, I was thinking Richard is probably resting, burned out from a tough challenge saving a planet that was about to be destroyed by Terrax the Tamer or something. He’s just somewhere gazing at the stars, or else he’s hooking up with Gamora, the deadly beauty who is his sometime ally. Can’t do that with the helmet on. I decided to throw another one in here, too. Because why not? This one uses Blender and Daz Studio as well. Ok, I’m trying to keep the word count down on these posts, so I’ll go ahead and wrap this one up. It’s all about the art, anyway! With that said, I sometimes debut these things on my Hypertransitory Facebook Page or even on my Instagram, so if you want to see some of these early, then make sure to hit me up on there. With all that said, I’m outta here – I’ll see you guys next time! The helmet looks cool! Really cool! 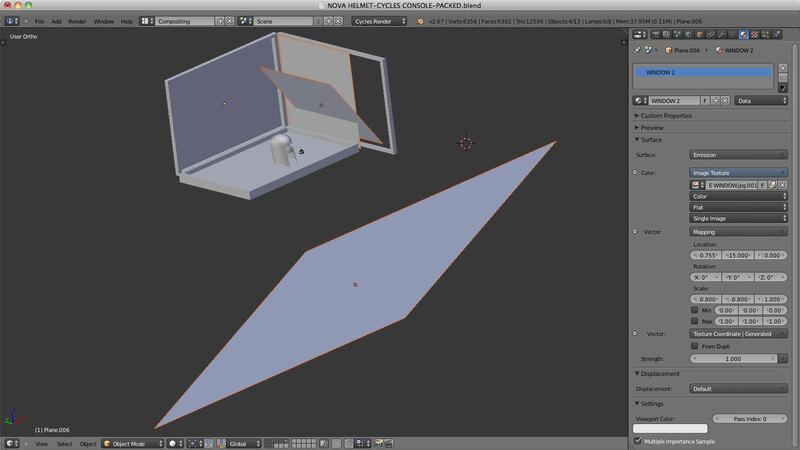 Though I didn’t really understand the mechanisms of making it..
thanks man, and I understand the 3D jargon can look like a lot of gibberish lol. Sometimes it’s tough for me, too. Good to see you, hope all is well! Your blog is super cool! :) just liked the way you write the content! Only one thing I would like to say…Amazing and beautiful work.